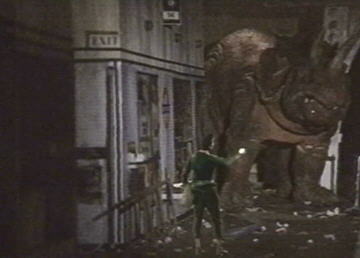 In this 1974 story, Jon Pertwee's incarnation of the errant Time Lord returns to 20th century London to find the capital evacuated following the sudden materialisation of dinosaurs around the city. 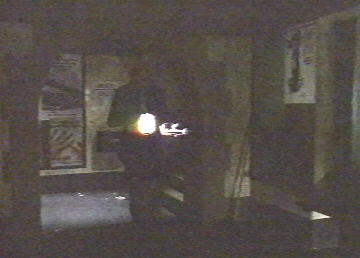 At one point he tracks down the temporal disturbances that accompany the appearances to an Underground station, in which he find a lift disguised as a cleaners' store cupboard. 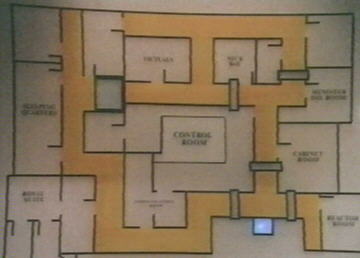 The lift leads down to a secret government bunker, where - inevitably - the bad guys are holed up. 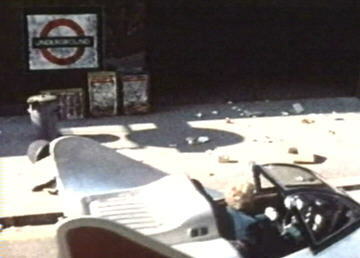 The exterior used in the location filming was "Moorgate" station - although the name is not visible - but the studio sets of the interior do offer a brief glimpse of a roundel with a name beginning with "TRAF..." At the time this story was recorded, the only station this could have been was "Trafalgar Square", which was the original name for the Bakerloo part of what is now Charing Cross, over 5km from "Moorgate." 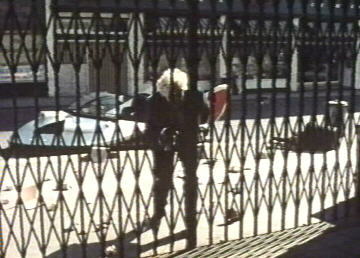 Elsewhere in the story, however, another entrance to the bunker is revealed to be in a government building on Whitehall, the northern end of which being where "Trafalgar Square" was. As a side-note, in the contemporary novelisation of the story, the Underground station is given the fictitious name of "Winchester," which doesn't even make the remotest sense, there being no district or street similarly named remotely near Whitehall! 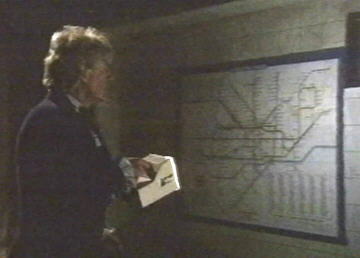 Just before pulling up outside the Tube station, the Doctor checks his map - clearly showing Buckingham Palace on the left and Whitehall on the right. 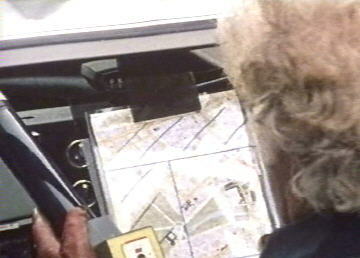 The vehicle is the gadget-obsessed Pertwee's own "Whomobile," although at the time of filming it was not quite finished, hence the jury-rigged windshield. 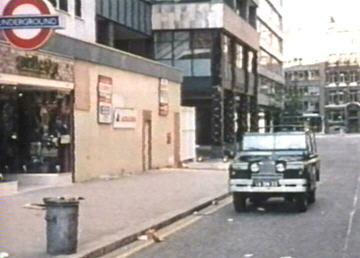 Based on a 3-wheeler Bond Bug chassis, the car was actually street-legal, and also appeared in Pertwee's last story, The Planet of the Spiders. The Underground diagram on the wall is bang up-to-date, even showing the Brixton extension of the Victoria line, then under-construction. 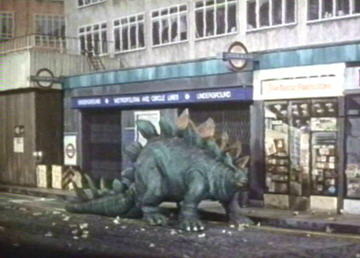 In this brief enhanced shot, it can be seen that the station name on the roundel begins with "TRAF..."
After all the efforts of the location footage to avoid showing it was actually "Moorgate" used for the exteriors, the model-makers give the game away with the "METROPOLITAN AND CIRCLE LINES" detail on the facade! 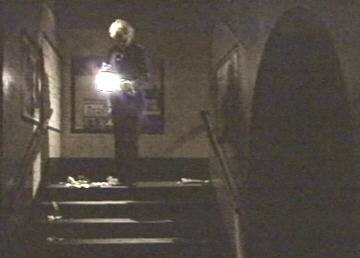 "I never thought I'd find myself blowing a Tube station. 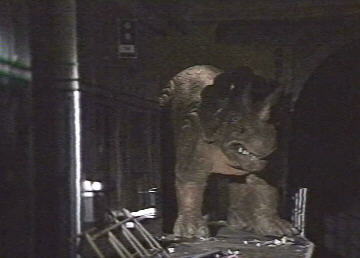 If you're wrong, Doctor, I could have a job explaining this to London Transport!" 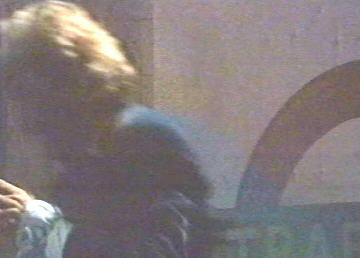 Short memory, Brigadier.... [see Doctor Who:The Web of Fear]. 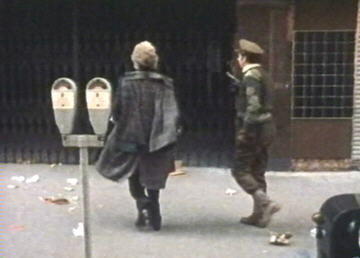 As the Doctor and the Brigadier prepare to blow their way into the bunker, something slow and unconvincing lurks on the platform.... 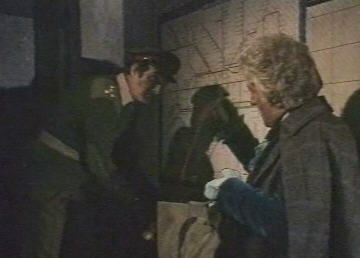 Hopelessly out-of-scale, the live-action Brigadier is overlaid on the model set!